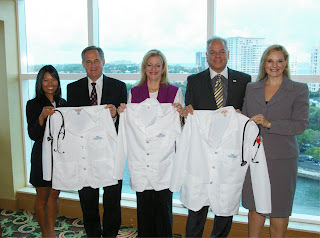 Kaye Communications, Inc. will sponsor its first annual “White Coats 4 Care” reception to benefit the inaugural class of Florida Atlantic University’s new medical school in the Charles E. Schmidt College of Medicine on Monday, August 1, 2011. Event admission is a pledge or donation with a minimum per-person gift of $100 to underwrite and dedicate a white coat for a new medical student. The important fundraising event, which offers a wide variety of contribution opportunities to support the new school and its students, will take place from 5:30-7:30 p.m. at The Bridge Hotel’s Carmen’s Restaurant – Top of the Bridge located at 999 East Camino Real in Boca Raton. To attend the “White Coats 4 Care” reception co-hosted by the Bridge Hotel, guests can select from a meaningful roster of contribution opportunities. In addition to the minimum $100 gift to underwrite a white coat, gift opportunities range from $150 to underwrite a student’s stethoscope to a full medical student welcome package, and scholarship award, all presented with a personalized welcome note with the donor’s name and information about them. Other opportunities for support include the dedication of a chair in a classroom or auditorium, or sponsorship with “naming ability” to underwrite one or two “Care in the Community” health screening and patient care programs staffed by the medical students twice a year for indigent members of the community. Not coincidentally, August 1st is also the day that FAU’s Charles E. Schmidt College of Medicine is to officially welcome the charter class of its new medical school. Later in the week on August 4th, during a special ceremony, each medical student at FAU will receive a white coat, which represents integrity, compassion and trust and symbolizes their shared commitment to serve patients and honor the Hippocratic Oath. The “White Coats 4 Care” reception, to be attended by a supportive cross-section of healthcare, business, community and civic leaders, kicks-off the Greater Boca Raton Chamber of Commerce’s month-long “2011 Greater Boca Raton Festival Days,” now in its 20th year. The annual series of fun-filled events are held at different locations in Boca Raton during the month of August pairing non-profit Boca Chamber members together with for-profit chamber members with the objective of raising awareness and vital funds for the non-profit member’s philanthropic efforts. Kaye Communications, a South Florida-based integrated marketing and public relations firm, pairing with FAU’s new medical school was a natural fit according to Bonnie Kaye, Kaye Communications firm president. Bonnie serves on the board of directors for the chamber and firm partner Jon Kaye serves on the advisory board of the medical school. The concept and the theme of the event — to “dress” and equip the inaugural class for success — was developed to heighten awareness of the new medical school, embrace Florida’s future physicians with a warm community welcome, and raise vital funds to equip these students with the tools they need to begin their medical education and launch their careers. “We are pleased to introduce “White Coats 4 Care” to celebrate a few milestones: the accreditation of a new medical school in Boca Raton, its inaugural class of 64 exceptional young men and women, and our firm’s 15th anniversary serving the needs of our clients, initiating and promoting the benefits of meaningful public-private partnerships, and stewarding a “collaborative” efforts to support the on-going betterment of the greater Boca Raton community,” said Bonnie Kaye. FAU’s Charles E. Schmidt College of Medicine charter class has a cumulative GPA of 3.71 and an average MCAT score of 31.5. These numerical measures are right in line with the national benchmark of all students who began medical school in the U.S. last year. All of the major colleges and universities in Florida are represented in the entering class, including five who attended FAU. Other students who have been accepted in the charter class come from Princeton, Johns Hopkins, Cornell, Yeshiva, Vanderbilt, Duke, Brigham Young, University of Michigan, Notre Dame, University of Virginia, Washington University in St. Louis, Amherst, Boston College, University of Pennsylvania and Wellesley. Troy McLellan, president and CEO of the Boca Raton Chamber of Commerce, believes the new medical school is important to Boca Raton and that it is a worthy recipient of the Festival Days’ and Kaye Communications’ philanthropic efforts, and is pleased that Kaye Communications has chosen the medical school as its beneficiary to kick off our 2011 Festival Days. 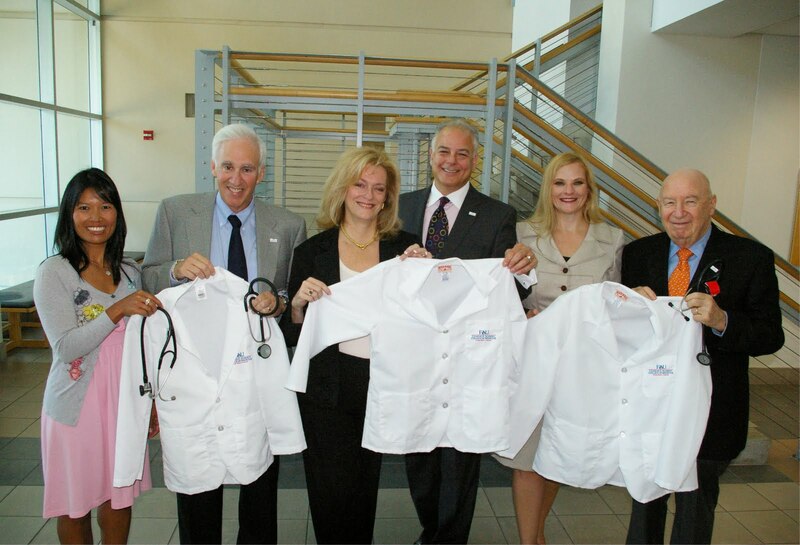 For more information about the “White Coats 4 Care” reception, pledge your gift to attend the event, or to make a contribution, contact Kari Oeltjen, director of development, Charles E. Schmidt College of Medicine at FAU at koeltjen@fau.edu or 561-297-2510.